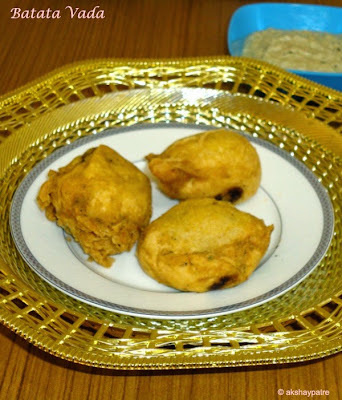 Batata vada or aloo bonda recipe - Batata vada is one of the classic deep fried snack that we are never bored with. The hot batata vada is an absolutely delicious snack with some spicy chutney and you can't stop it with one or two. 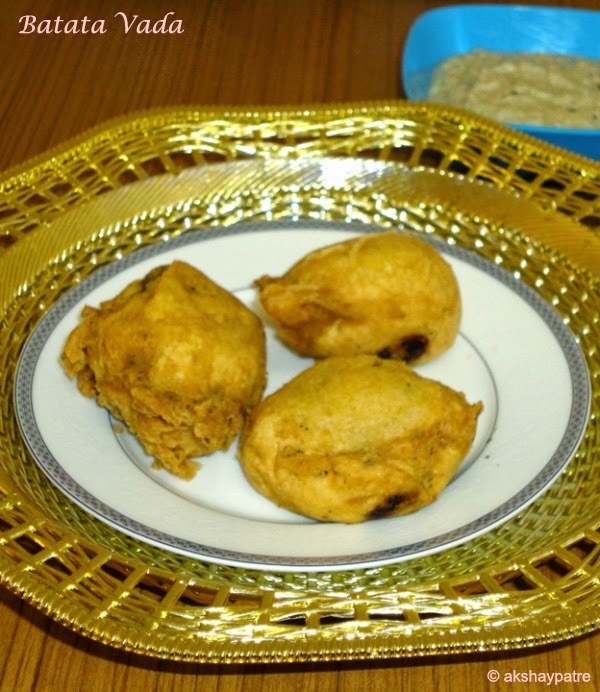 There are many ways to prepare the traditional Indian batata vada. 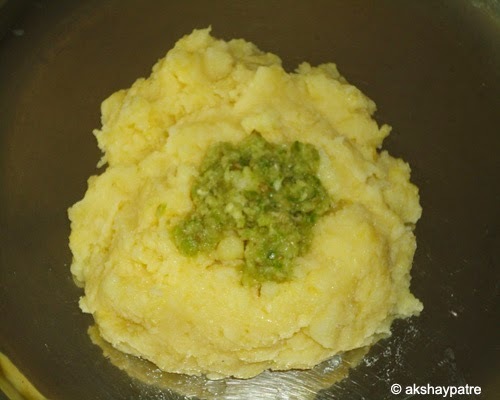 However, the best and the proper method is the perfect combination of ginger, garlic, green chilli paste and finely chopped cilantro with mashed potato is the key secret to make an absolutely delicious vada. I receive frequent demand for this vada from my sons and it doesn't need much of an effort. Friends, try out this delicious vada this weekend to treat your family and enjoy. Wash and peel the potatoes. Place them in a steamer and steam till the potatoes become very soft and set aside to cool. Grate the steamed potatoes using a grater. Mash it with a chapati presser and set aside. 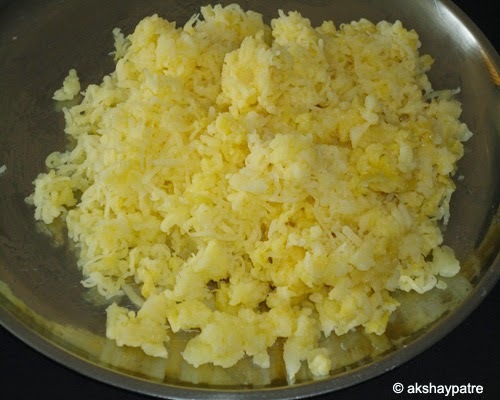 Grind together the green chillies, ginger and garlic with 1 tbsp water. Pour this paste on mashed potatoes and mix. Add the chopped cilantro, 1 tsp salt and mix. 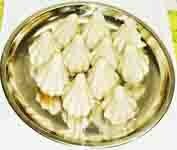 Take gram flour / besan in a bowl. Add salt, 3/4 cup of water and mix to make a thick batter. Take a large lemon sized potato mixture and dip it into the batter and evenly coat. Heat sufficient oil in a pan on medium heat and slide it in the hot oil and deep fry until golden. When it is done, drain on absorbent paper. Serve the batata vada hot with choice of your chutney. 1. Wash and peel the potatoes. Place them in a steamer and steam till the potatoes become very soft and set aside to cool. 2. 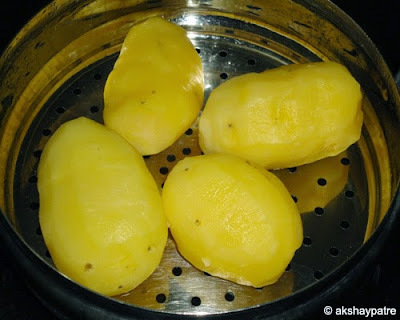 Grate the steamed potatoes using a grater. 3. Mash it with a chapati presser and set aside. 4. Grind together the green chillies, ginger and garlic with 1 tbsp water. Pour this paste on mashed potatoes and mix. 5. Add the chopped cilantro, 1 tsp salt and mix. 6. Take gram flour / besan in a bowl. Add salt, 3/4 cup of water and mix to make a thick batter. 7. Take a large lemon sized potato mixture and dip it into the batter and evenly coat. 8. Heat sufficient oil in a pan on medium heat and slide it in the hot oil and deep fry until golden. 9. When it is done, drain on absorbent paper. 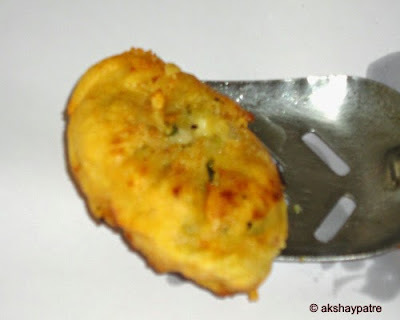 Serve the batata vada hot with choice of your chutney.